Mars may be geologically inactive but that doesn’t mean there’s nothing happening there — seasonal changes on the Red Planet can have some very dramatic effects on the landscape, as this recent image from the HiRISE camera shows! 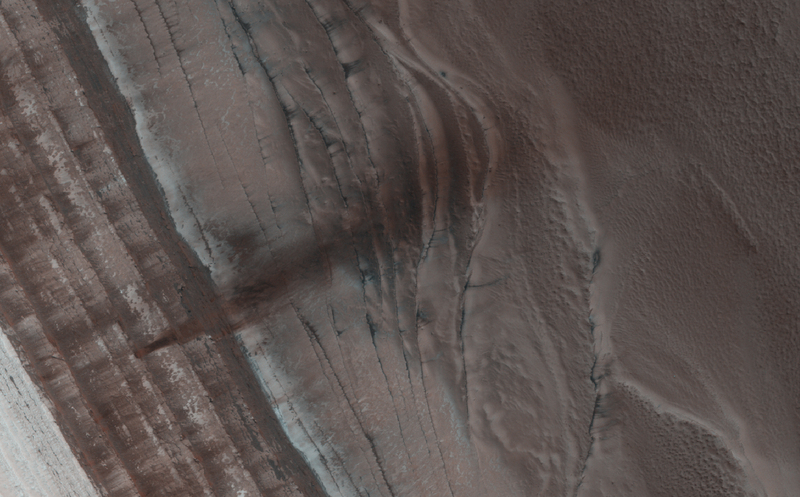 Circling Mars since March 2006, the HiRISE camera aboard NASA’s Mars Reconnaissance Orbiter has even captured some of these polar landslides in action. The rust-colored avalanche shown above has fallen hundreds of meters from the middle of a layered ice deposit, spreading nearly a kilometer across the frozen ridges at the base of the cliff. The view was acquired on Sept. 13, 2013. Check out a video explaining this view and the processes that created it below, narrated by Phil Plait (aka the Bad Astronomer).